January - I was suddenly gifted with an Embellisher machine – a machine that is basically a felting machine, as it sews with 7 barbed needles, but no thread. I had a wonderful time making up this fairytale winter scene using this machine, various fibers, confetti, yarn, and hand-dyed paper. To make a tree, just lay the yarn on the background and “punch” away! 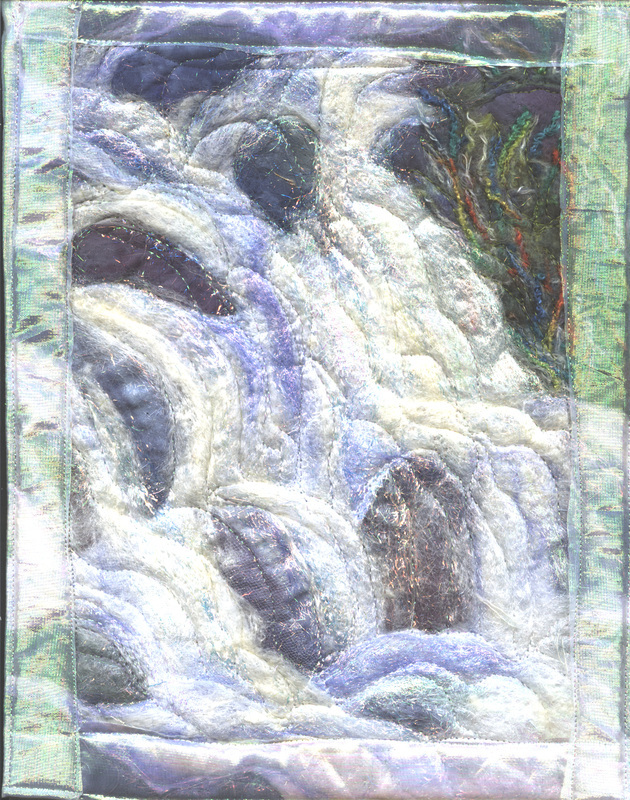 February - Well, I wasn’t done playing with the Embellisher, so I tried it again, using more fibers and fabrics, yarns, Angelina fibers, fabric and paper to make this scene of flowing water. It still looks pretty icy, but I think the thaw is setting in! I was raised in Minnesota, so this reminds me of my younger days. March - While we were visiting family in Minnesota, the Pope died. The night of his Vigil service, we drove by the Cathedral in St. Paul and saw this lovely angel, high atop the dome behind the main dome, who seemed to be praying with us all that night. The background is felted fibers, the statue is Puff Paint, painted with Shiva paint sticks. May - We went to the ocean again, and I simply couldn't resist making another ocean waves piece. I am endlessly fascinated by the challenge of making water flow and spray over rocks, so you can almost hear the susurration of the ebb and flow. July - Back to the ocean to celebrate my birthday. 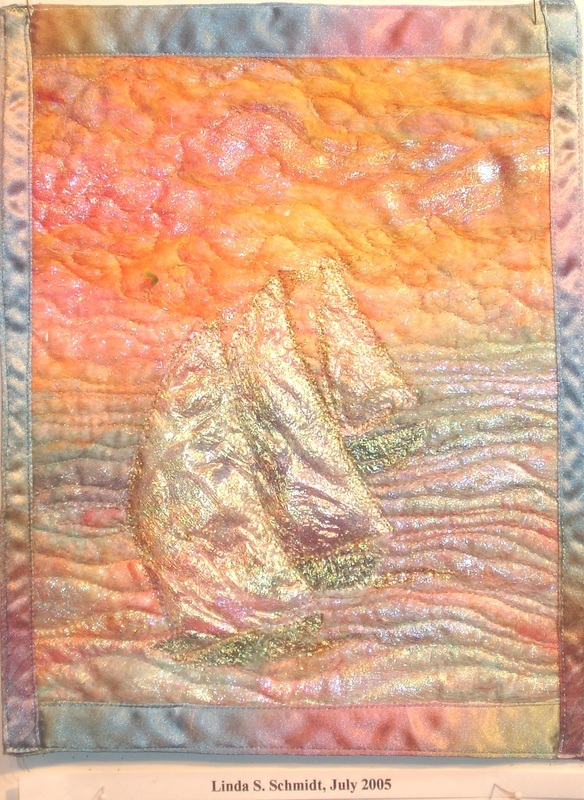 This time, there were sailboats against the sunset, so I used Angelina and other fibers and felted them into the background with the Embellisher, then melted cracked ice with a heat gun to form the sails of the ships. 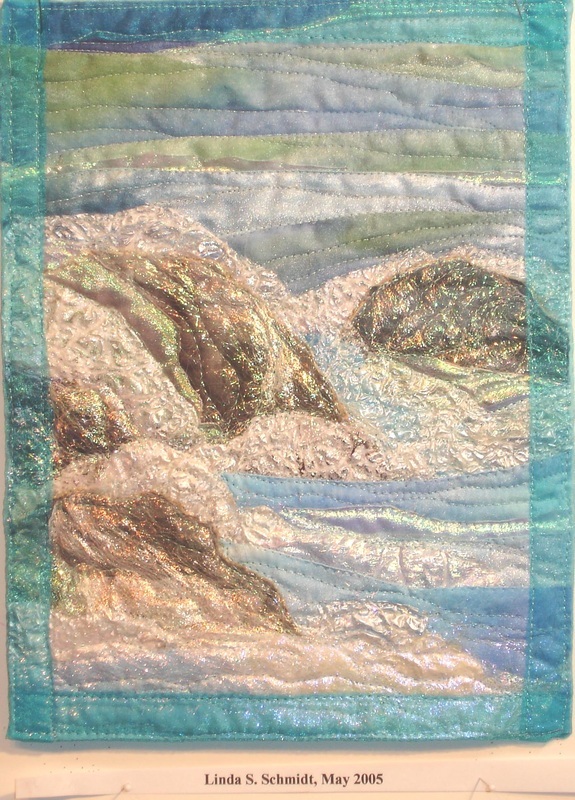 The water is a sheer fabric over more felted fibers. September - It's Fall, once again, so out come the bright colors and the Embellisher machine. 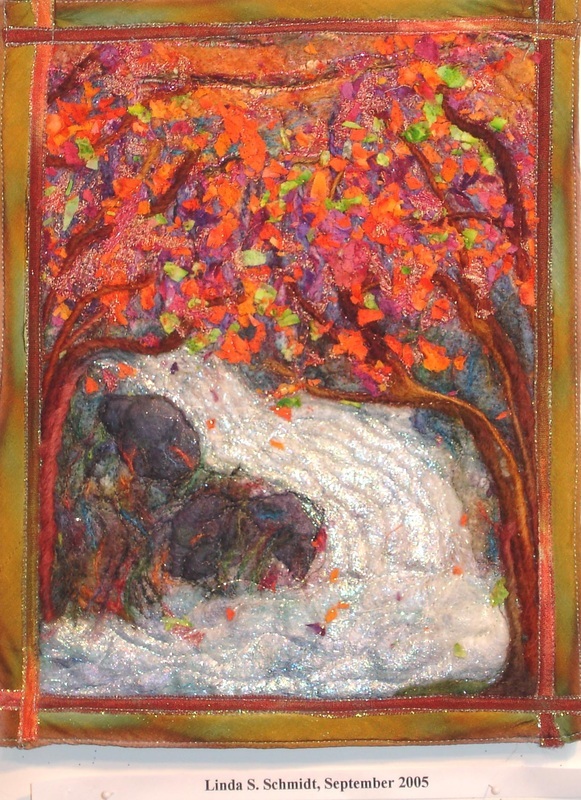 The leaves are bits of fabric that were cut with a rotary cutter, then dribbled on the fiber, fabric, and paper scene. 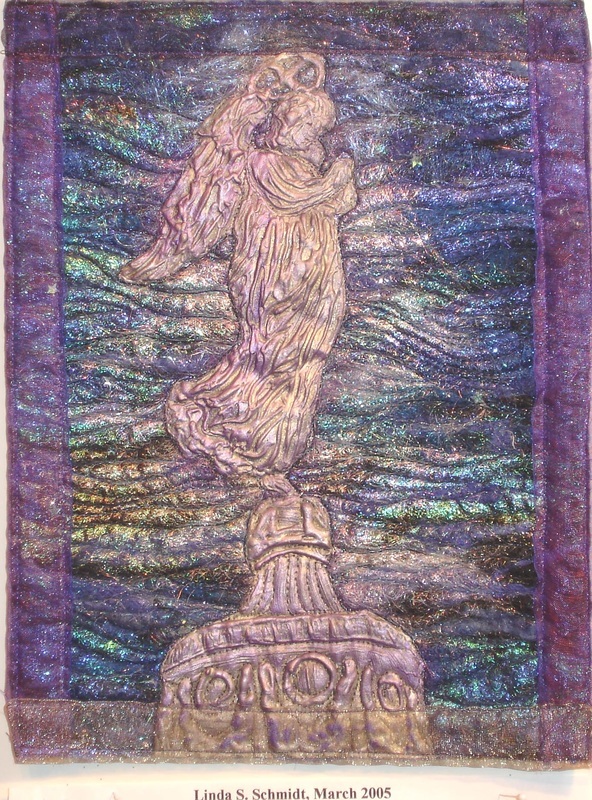 The water is shimmery silks and organzas, Angelina and silk batting fibers. April - While we were in Minnesota, I saw a lovely photograph that my brother-in-law, Buddy Ferguson, had taken of my sister, Gloria, her day-care child, Cole, and two friends, Amber and Mary in the park. 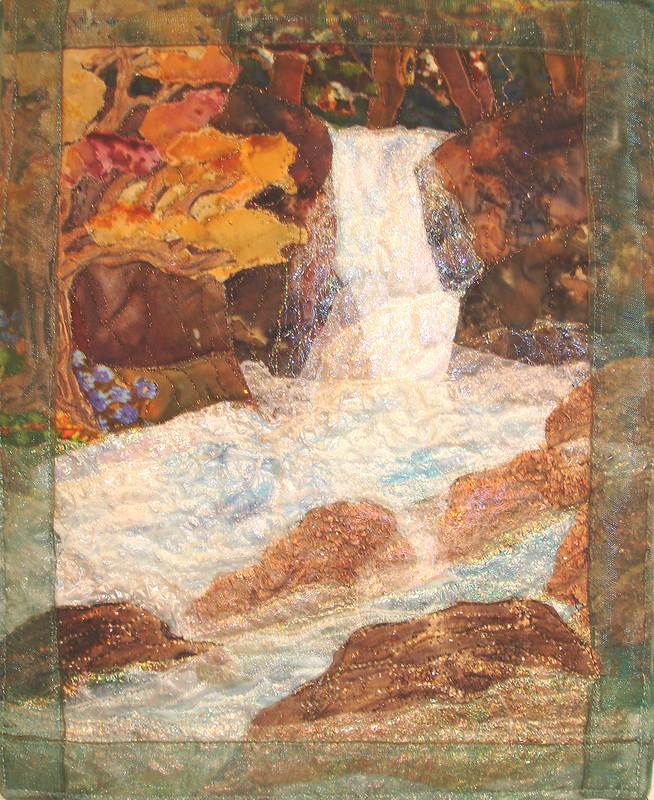 Given permission, I used the photograph to make two large-scale quilts of the scene – one for Gloria’s office and one for myself. 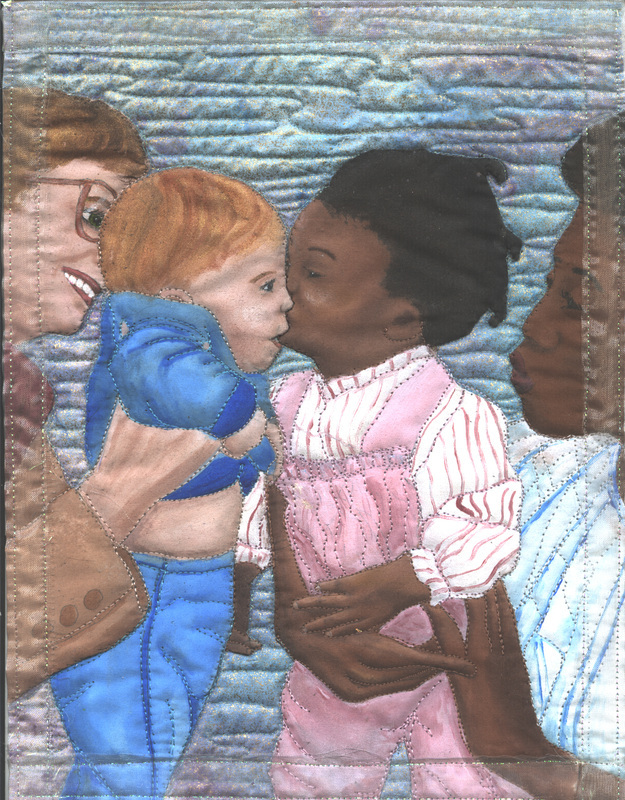 This is a painted, miniature, version, of the center of that quilt. The real quilt uses lots of corduroy, ribbons, and real jewelry on the people. August - On another trip to Colorado, my hostess took me to the Monument, where I saw this perfect, blasted tree (for another project I’m working on). 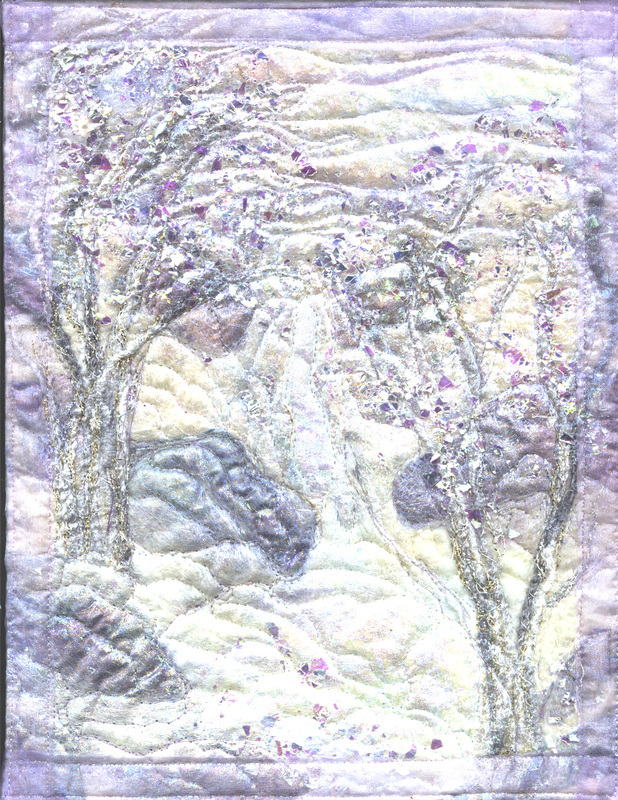 Just for fun, I used the Embellisher to create the tree out of yarn, then sewed it down to recreate this desert scene.